I love to read a good book. I have had the opportunity to read two very different books in the last few weeks by authors who have Parkinsons’s. At the World Parkinson Congress, I was fortunate to hear author Alice Lazzarini talk about her book Both Sides Now: A Journey from Researcher to Patient. Her story is compelling and I could not put the book down. 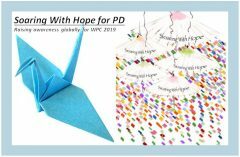 Shake Rattle and Roll With It: Living and Laughing with Parkinson’s by Vikki Claflin, is a very different take on PD by a humorist blogger. How could this be? She went to work and confided in a co-worker who had been diagnosed two months earlier. They cried together at the irony that both PD researchers were diagnosed with Parkinson’s as they were making groundbreaking discoveries for that same disease. In Both Sides Now: A Journey From Researcher to Patient Alice Lazzarini tells the story or her illustrious career and about her diagnosis of Parkinson’s Disease. She recounts difficulties faced by women in the workplace, especially in academia, at that time. Many years later, encouraged by the visionary doctor she worked with, Roger Duvoisin, she finally pursued her PhD. In 1996, her groundbreaking study with the Contursi family from Italy led to the discovery of the alpha-synuclein mutation, PARK1, and revolutionized the field of Parkinson’s research. Yet, when confronted with the early symptoms that she knew pointed to PD, she did not seek medical treatment. It took almost a year for her to finally see a colleague for an evaluation and the confirmation of her worst fears. Like most of us, she tried to hide the tremor that appeared early on. When she hosted an advisory board meeting in London for Parkinson’s specialists several months later,she began to see PD from the other side – the patient’s side. Statements made by other doctors that were not offensive before, now bothered her immensely. But the biggest issue that confronted her was how could she remain a professional and be a patient at the same time? In spite of her amazing career, she faced the same issues that we all do when we hear those four terrible words “You have Parkinson’s Disease”. We have gone through denial, hidden our symptoms, and pretended that all was ok, when inside we were terrified. We did not want people at work to know because it could jeopardize our careers. Dr. Lazzarini was no different, and that is why her story is so easy to relate to. Once she finally came to accept her disease, and her fate, Dr. Lazzarini retired from research and wrote her story for herself. Fortunately she decided to share it with others who are living with Parkinson’s, so that we can better understand this disease. Her story is an inspiration, and her discoveries have revolutionized the approach to Parkinson’s research. Because of this amazing woman, we all have hope for a future without Parkinson’s. In contrast, Shake, Rattle & Roll With It: Living and Laughing with Parkinson’s by Vikki Claflin, who has been writing about her experiences with Parkinson’s in her blog, Laugh Lines, gives us a very different take on PD. There is a saying that if you write a blog about Parkinson’s, you will eventually write a book about it. I have read some books by bloggers that are just awful. But this one I recommend highly. At times, I think she had channeled me and was writing about my experiences. She sees the same elephant in the room that I have seen and written about. I found myself nodding in agreement with her observations and laughing hysterically at some of her antics. There is no embarrassing PD story that is off limits. Any woman can relate to her description of shimmying into Spanx whether she has PD or not. (If you don’t know what Spanx are, imagine trying to stuff a comforter back into that plastic bag it came in. You just can’t do it!) Her 20 ways Parkinson’s tremors come in handy is a classic. And of course, when all else fails, there is always a glass (or bottle) of red wine with Milk Duds to get through the worst days. But underneath it all is a serious look at living with a chronic disease and how one woman copes with it by looking at the world through humor. Her final advice to us is “Even without a cure in your lifetime, you can fight a good fight.“ If you can laugh at the frustrations, epic fails and embarrassing moments, you will live a life made up of joyful moments and you have won the fight. Finally, for those of you who have read Alex Kertin’s Goodbye Parkinson’s, Hello life! : The Gyro-Kinetic Method for Eliminating Symptoms and Reclaiming Your Good Health , he just announced today that there is now a 30 minute exercise video that you can download. Go to My Exercise for Parkinson’s with Michael Wiese, the co-author of the book. Thank you so much for this terrific shout-out! I love that I could make you laugh about this sometimes scary disease, and your willingness to share my writing with your tribe. Laughter is medicine’s best wing-man. 🙂 Following you on Twitter!